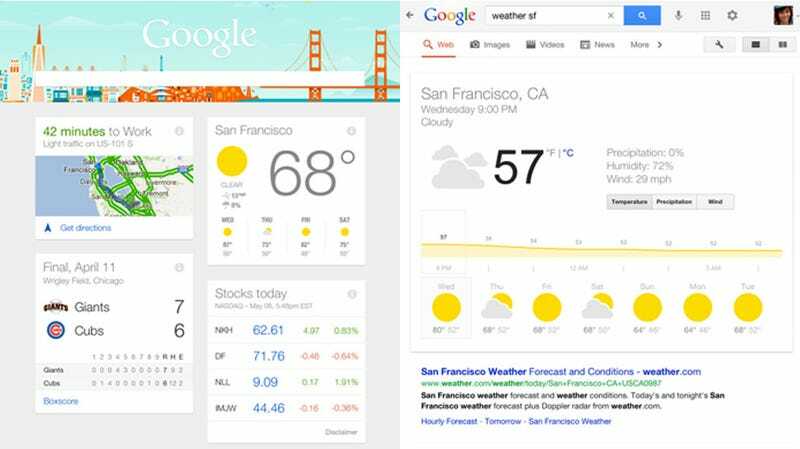 The addition of Google Now to the iOS App Store has granted iPhone owners access to one of Google's most useful products. But it did something else, too. It made the iPhone a better Google phone than the vast majority of Android phones you can buy. Let's be clear right up front; if you want a top-flight, pure Android phone, you should be looking at the Galaxy S4 or Nexus 4 or HTC One, full stop. Not only do they—and a few other flagship handsets—feature powerful hardware, they're also equipped with Jelly Bean, Google's last major Android update. They're wonderful, you would enjoy them. But those phones represent a lonesome minority, an elite advanced guard that most existing Android handsets may never join. Only 25 percent of Android devices run Jelly Bean, which means that only one in four can access Google Now. And most older phones will never get promoted. And even if they do, individual app updates—even for Google products—can take forever. By contrast, today's addition of Google Now to Google Search means that any phone running iOS 6—which means every iPhone back to and including 2009's 3GS—has access to one of Android's marquee features. And that's just Google Now. There are 25 Google iPhone apps available in the iOS App Store today. Nearly all of them have been updated in the last three months, and the ones you use the most—Gmail, Google Maps, Chrome, etc—are kept up as up to date as their Android counterparts. They work in harmony, too; trying to find directions in Google Now will open Google Maps instead of Apple's mediocre alternative. And as long as you're signed in with your Google account, what you do on one device carries over to any other. Combine that interwoven goodness with the iPhone's exquisitely chamfered, super-lightweight body, and you've got yourself quite a package. To the extent that the Android experience is the Google experience, you really can't do much better. There's more to Android than just Google apps, of course. The iOS desktop experience is far more rigid than what you'll find on even the clunkiest Froyo device. And while iOS notifications go a long way towards the seamless integration of Google services, you still can't get anything approaching the customizability Android provides with stock iOS. But even that objection is largely surmountable. Jailbreaking an iPhone doesn't give you the same godlike powers as rooting an Android device, but it does let you continue to use App Store apps (like Google's) and make the phone look and feel like your own. Or like… Android. The other big drawback is that some Google apps on iOS will lag behind, say, the latest Nexus release on certain features. But at least you can be more confident that you'll get them eventually. The fact is, Google still doesn't ultimately care what device you're using its services on, just so long as you're using them. That's not going to change any time soon. Openness is baked into all of Google's services. Whereas iMessage's one true aim is to keep you bottled up inside iOS forever, Google has built Drive, Mail, and all of its other pillars to be as platform-neutral as possible. The more people using Google, the more highly relevant ads the company can serve. And while the iPhone has always benefited from that to some degree—especially since Mountain View took charge of its iOS apps once and for all—Google Now's iOS availability is a strong acknowledgment that the company's willing to prioritize mass adoption of its best features ahead of getting its legacy Android devices up to speed. What that means for you—since iOS updates bring so many legacy devices along with them—is that you can have more faith that an iPhone you buy today will get future Google bells and whistles than the vast majority of currently available Android phones. Again, by all means, get an HTC One or a Galaxy S4. But do it for the design or the skin or the camera or the features. If it's Google you're looking for, you might just want to swing by the nearest Apple Store.